This is a 12-pack of interfacing templates for the Morning Star Hot Pad. Whether you make the Hexagon, Round or Square hot pad, the template is the same. The package does not contain the pattern or instructions, but is a refill set of templates. The pattern can be found at this link. Morning Star Pattern. The interfacing stays in the hot pad, and directs the position and sewing of the design. You can see how it works if you watch our teaching videos. Each bolt has 25 panels, and each panel has six templates. The material content is polyester/rayon 70-30 and is sheer, non-stretch, smooth and strong. This is a new option for sewers and shops, allowing customers to purchase by the panel, instead of single cut sheets. 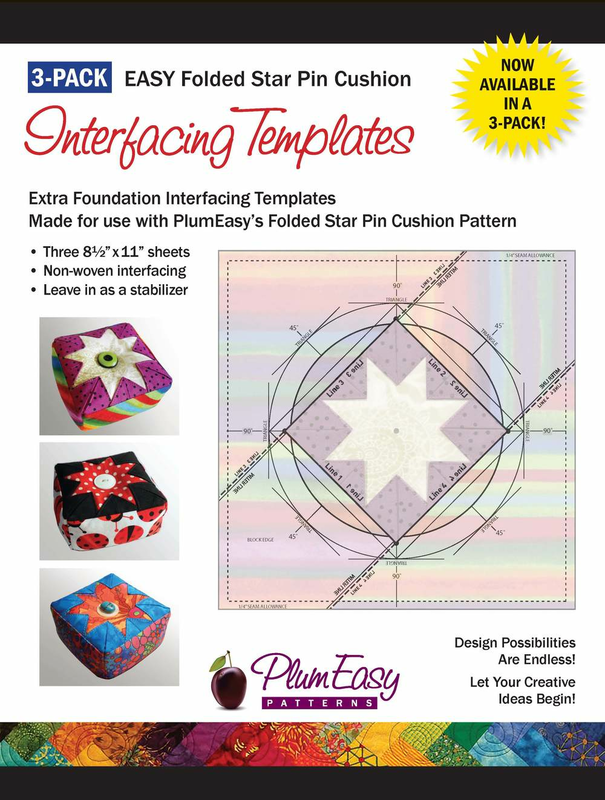 Multi-Pack refill of Foundation Interfacing Templates to use with the EASY Folded Star Pin Cushion Pattern. The first of its kind, the Folded Star Stencil tool creates a measurement method to place fabric in equal distances from each other and from the center of the star. This revolutionary way to make a folded star hot pad was created to speed up making these projects, and to give consistent, accurate spacing without measuring. The stencil can be used for any pattern using an 8-pt star with 90 and 45 degree alignment. The stencil also makes an EasyStar block with the use of prairie points, in five different sizes. It features 22.5 degree marks for varying placement of fabric as well. PlumEasy Patterns has developed new patterns that use the stencil, making it versatile beyond their bestselling EASY Folded Star Hot Pad. These include Tulip Surprise Quilt and BabyStar Sweetie Quilt. The Folded Star Stencil comes packed with a Creative Guide that includes three patterns and complete instructions for using the tool. The stencil is a must-have tool for sewers.